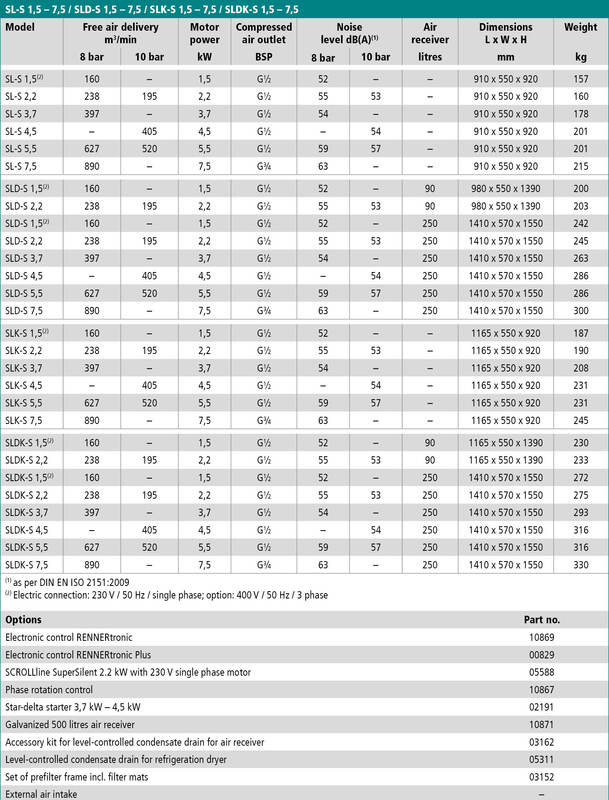 Is it to be mobile or stationary equipment? 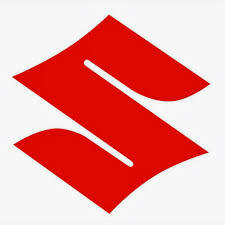 We provide mobile machines as standard; and rubber bonded metals are provided loose. 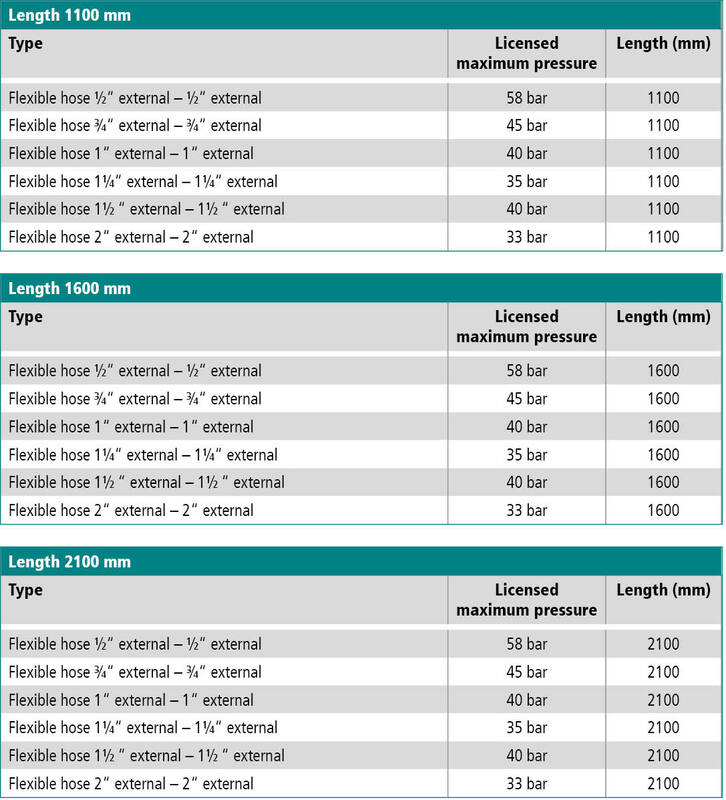 By simply changing the wheels for these rubber bonded metals you can, if necessary, convert the piston compressor to an elastically-mounted, stationary installation. 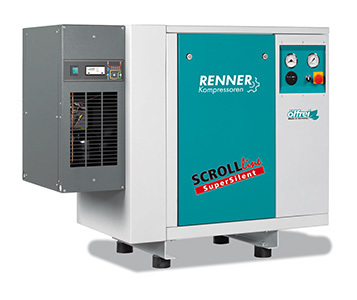 A reliable V-belt drive and low rev-rates and piston speeds ensure the safe supply of compressed air. 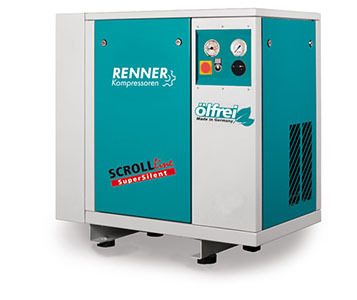 The compressor is powered by a 3-phase power 230/400V ~ 3 / 50 Hz (1.5-kW machines also available in 230-V design), controlled fully automatically via a pressure switch with overload protection, and supplied ready for connection and use, together with cable, plug and pressure reducer. 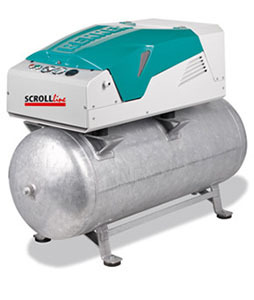 Models with container volumes from 90 litres upwards come with the Condor pressure-switch, with hour meter included. 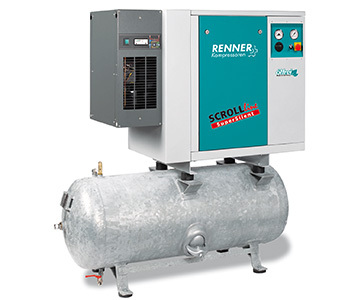 These stationary compressor installations provide, through their sensible grading, optimal cover for normal power requirements from 2-stage compressors upwards, and these and an efficient cool air system ensure reliable and economical operation. Fully automatic control occurs via a pressure-switch with relief valve and motor protection switch. 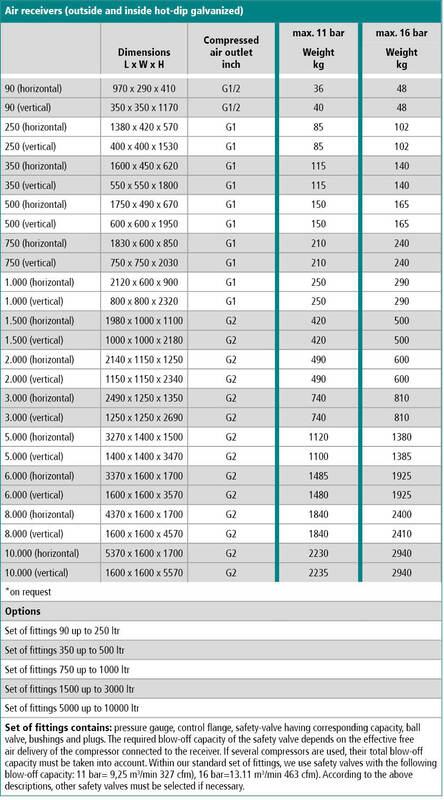 A magnetic relief valve and star-delta switch are included in models from 5.5 kW upwards. The rubber bonded metals allow installation without a base. 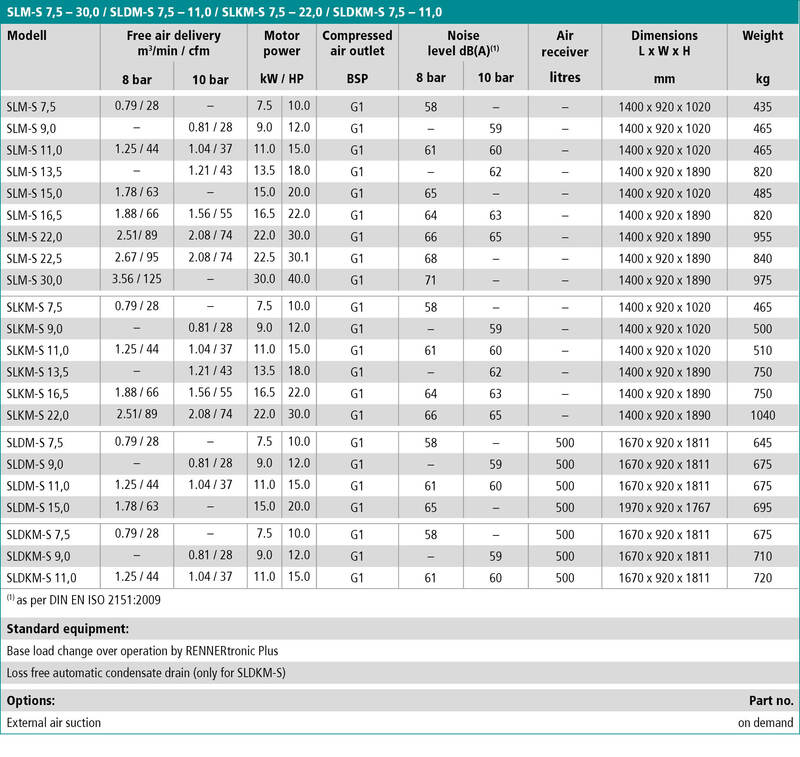 All receivers are built according to AD2000 directives. 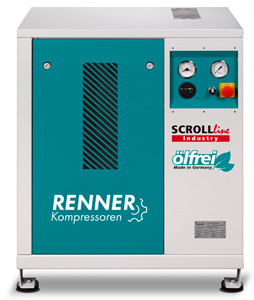 SCROLL compressors are interesting alternative for generating oil-free compressed air.The process of compression is achieved by means of a fixed and an eccentrically revolving spiral. Any contact is thereby eliminated, guaranteeing reliable operation and low wear. 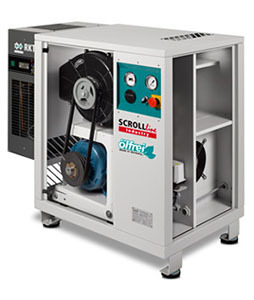 SCROLL compressors are an interesting and economic alternative for generating oil-free compressed air. The process of compression is achieved by means of a fixed and an eccentrically revolving spiral. Any contact is hereby eliminated, ensuring a reliable operation with low wear. As a SuperSilent-model, the compressors are also suitable for operating in control workplace environment. 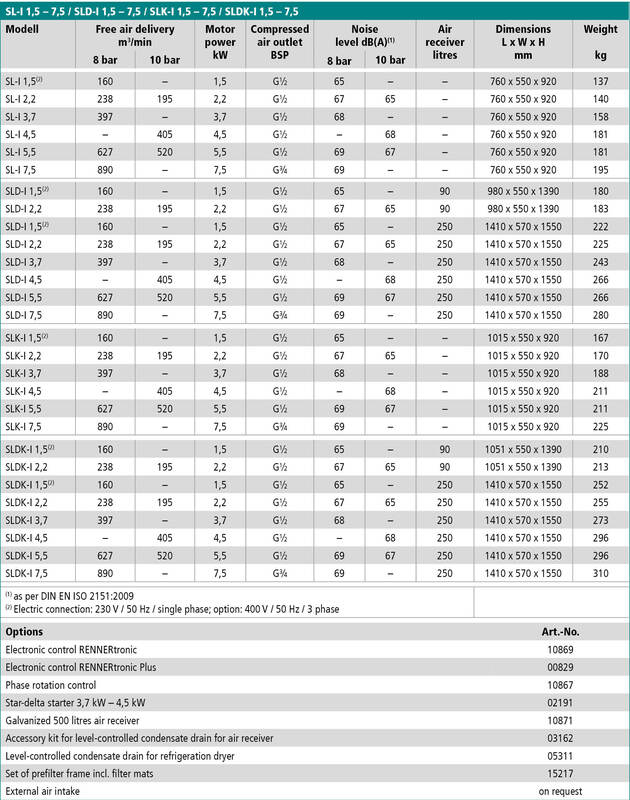 Noise levels from 52 dB(A) speak for themselves. 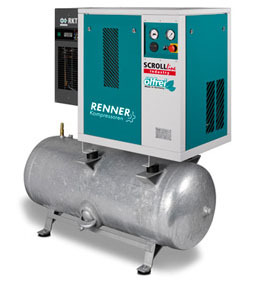 The oil-injected screw booster, the RENNER RS-M, is made for industrial use and efficiently generating compressed air. 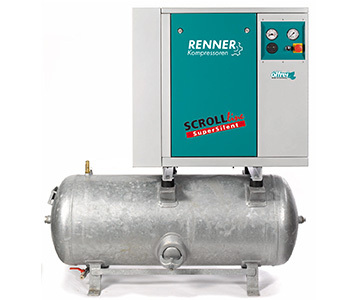 The RENNER RS-M booster increases the pressure at the 1st stage to 40 bar with a maximum flow rate of 10.5 m³/min (depending on the admission pressure, motor power and other conditions). 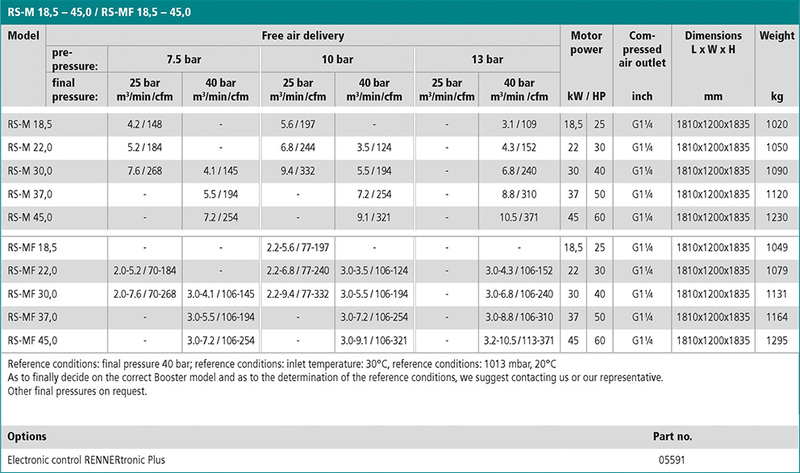 The range is from 18.5 to 45 kW at a final pressure of 40 bar. A booster system should consist of at least one RS-M booster, an admission pressure unit from 6 to 14 bar, an air treatment system between the admission pressure unit and the RS-M booster followed by an air receiver and another air treatment system (if necessary). 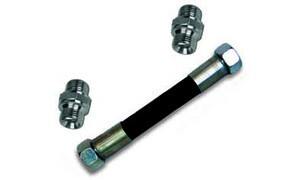 Encapsulated air ends eliminate pipe-work and links with known sources of problems. 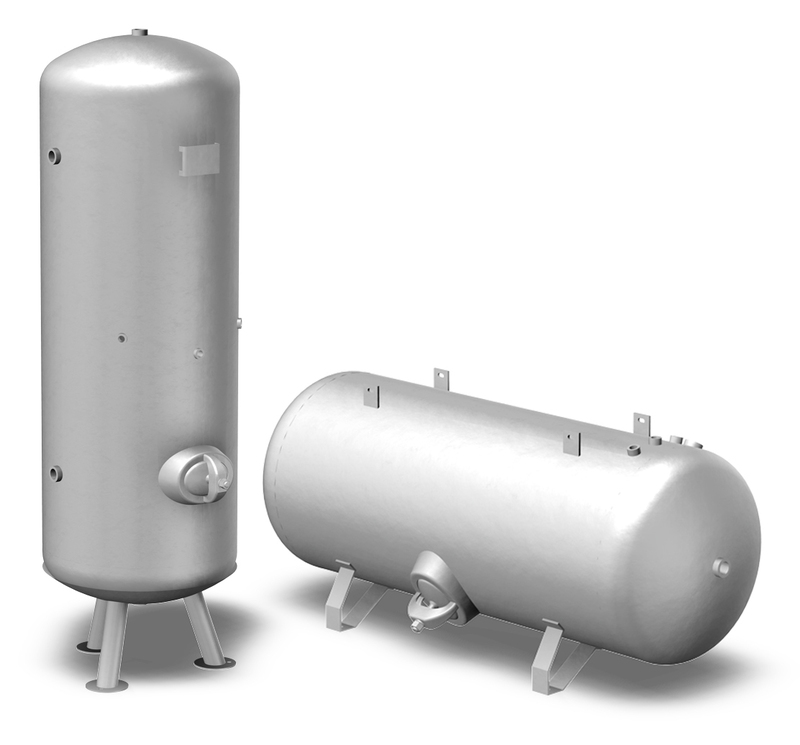 No need for separate oil tank, no need for pressure test certificates (up to RSF 45.0).